Since the launch of the new ERGO systems we have had a busy time to implement the new products in our production lines. High quality products are essential for us and we have really put all our effort into both the development and the production of the ERGO. We have developed our own high friction materials, our own extruded aluminum components, gear boxes, hydraulic systems and electronics for the ERGO. The ERGO sets the start of two new rail standards. Both are focused on light-weight and to be ergonomic for the operator. The roller beam is compact and light weight and at the same time very durable thanks to the aluminum core with the high-grade steel gear rack and guide rails. The ERGO SPINE system is made entirely of aluminum and the weight is reduced to half compared to the steel version. Both are still compatible with each other. Every single machine that leaves our factory has been subjected to our significant and individual functions and quality test. As a customer you always receive documentation for each unit, where the test is specified in detail. 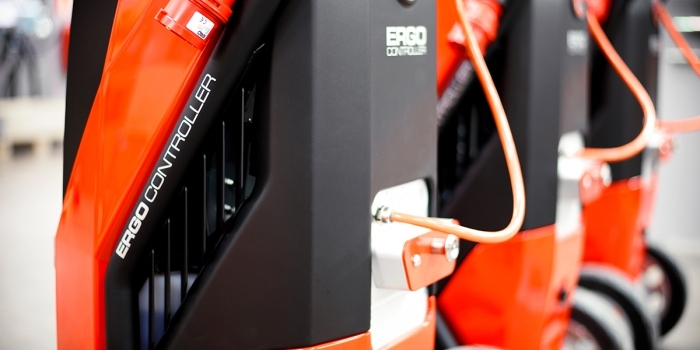 The ERGO controller is what powers the movement functions of the ERGO systems and sets a new standard on the market. They are built by us with a whole new thinking, where the components itself stands for most of the structure to keep the weight to a minimum and still have all the flexibility of the automatic functions from a robot. More information about the ERGO system is available under Products.